These coconut cupcakes are grain, gluten, fructose, nut and dairy free. AND they’re delicious. AND you don’t need to even break out the whisk or mixer. This is the perfect recipe for whenever there are food sensitivities or allergies of varying kinds at your next get together. 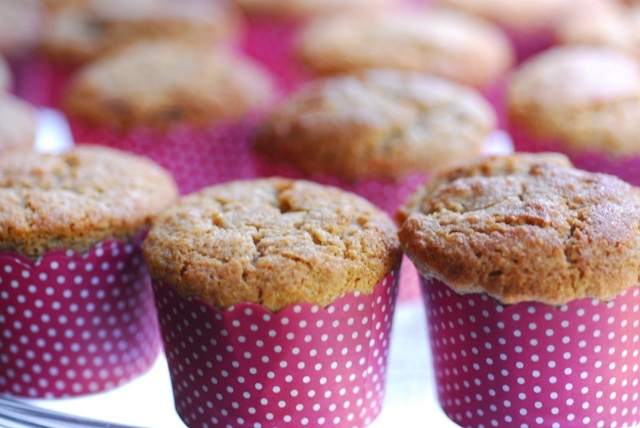 They’re our go to cupcake recipe for any occasion because they are just so nourishing and yummy. Texture wise, they pass off as a muffin – a few frozen blueberries or raspberries in the mix (like 3-4 blobbed into each individual one once spooned into the tins, and voila! A muffin transformation. Do let me know how you enjoy them. As I said as a variation, you could ‘hide’ a few blueberries in each one, once you’ve poured the mixture into the cups to give a more muffin like vibe. Fun little project for little people! To get ‘new to wholefoods kids’ across the line, you may need to pop a little icing on top to ‘cupcakify’ them a little more, if you know what I mean! 160 ml rice syrup (I feel better personally with low/no fructose baking when possible given that the liver can process about 2 pieces of fruit’s worth a day… if you don’t subscribe to that choice feel free to use honey, maple syrup, coconut sugar, coconut syrup or rapidura as unrefined natural sweetening options. You could also use stevia glycerate or erythritol if needs be, although I find them to taste very chemically). Pop the oven on 180C / 350 F, non fan forced setting. Once you’ve got everything in your wet and dry bowls, just give them each a little stir through. Combine the bowls together and stir through until just combined. Leave for a minute to firm up. Pour into your cupcake cups, leaving 1cm off the top for rising. Bake for 20-25 minutes, doing a skewer test at 20 minutes to check. Skewer comes out clean? You’re done. Pop everything (make sure butter is cooled so it doesn’t cook the egg) into the thermomix and blend on Speed 6 for 5 seconds. Reverse Speed 5 for 3 seconds. Done. If you find it hard to look for any of them? I love organics on a budget's site in Australia. If you're in the US / UK or elsewhere and there's a great retailer - physical or online - do give them a shout out here for anyone else who might need to know! Looking lovely. I do have to jazz up my healthier snacks for the kids sadly. And in fact their eating has been sliding slowly but surely. End of school term is always good time to give myself a kick in the bottom about food. Would you be kind enough to include measurements in cups and tsp/tbls. We just haven’t adopted grams and ml. These look delicious. Do you think you could substitute almond meal for the buckwheat flour? I haven’t got buckwheat and i’m trying to use what ingredients I have on hand. Thanks again for your inspiration, wisdom and awesome writing style. I’d say you could, but almond flour bakes even shorter than buckwheat (as in shortness of crumb) so you might want to bake as a loaf and then cut slices and toast + butter and serve that way. I’m also wondering whether an additional egg white, beaten and folded through might help give a little lightness, as the almond flour is far more dense than the buckwheat. Could you report back how you go with the substitution if you go through with it? Many thanks and hope you’re having a fab easter weekend, Alexx. So I just made these with almond flour. I was a bit skeptical especially since I used the Cherie Vardy method of measuring (ie yeah thats looks about right – bung it in), but what do you know – they worked!! I did what you recommended and used an additional whipped egg white. They are moist and delicious! Only problem is they only made 5 large sized ones! Not sure it was my measuring but it is probably for the best as ‘cuppa and cupcake’ time today may be repeated once or twice today haha. Thanks again for your recipe. I have posted a piccy on facebook and tagged you if you want to check it out. These are so so good. Not really a cup cake fan but doing some hands on research for a friend. These are so moist and delicious. Could easily add a sugar-free icing too. They also freeze really well. I’ve tried a few of your recipes now Alex .. Fast becoming a big fan. Wow! I made this yesterday and they were delicious! I added a dash of maple syrup just because I didn’t have quite 160 mls of rice syrup but I was still surprised by just how sweet they tasted! My partner polished off about half a dozen of them last night! Big thumbs up from us! Hi Alexx, finally got around to making these today and wish I had earlier. They are as brilliant as everyone has been saying and I can see I’ll be making them regularly now. People shouldn’t get overwhelmed by the ingredients list, it’s really easy. I love how when you use coconut flour it soaks up the liquid so letting it sit for a minute is like magic – lovely thick batter that’s easy to spoon in. I had run out of buckwheat flour so just used GF flour mix. Also I only put 120ml of rice syrup (as I used the same measuring container as the coconut milk and I always like to put less sweetener), so I added an extra egg. They were delicious, sweet, moist and had that great coconut chewiness. Thanks Alexx! I’m making them again right now for after school playdates, I’ll have 6 hungry children to bring home and your cupcakes will be perfect to fill them up. My daughter cant have any sweetener at all, esp anything fermented like rice syrup. Is it possible to leave out the sweetener altogether ir would i need to add other moisture. I would prob add a few frozen blueberries to it, for a touch of sweetness. You could definitely just use blueberries Kathie, perhaps puréed and in same quantity as the rice syrup in measurement so the moisture content isn’t too soggy. Let me know how you go! YUM! I am a bit of a coconut fiend so I’ll definitely be giving these a go. Thanks so much Tania 🙂 It’s definitely more of a ‘spoon into tins’ than pour… Honey and coconut milk substitutions shouldn’t have mattered unless coconut milk was solid from the top of tin only maybe? How did they taste? how did you go on second attempt tania? These are simply amazing. Light and fluffy. I threw some mixed frozen berries on top and they were a hit! Just cooking these now – taste testing the mixture before they go in the oven 😉 Can’t wait till they’re ready! Yay Tracey. How did you enjoy them? These were so beautiful! Made them for my son’s second birthday. Next time I’ll try with no sweetener at all. Thank you!! Alexx, could you recommend a nice ‘icing’ recipe? I’m thinking something coconut/cashew based maybe? S there anything you have tried that you would recommend? I’m going to make these for my sons 2nd birthday. Thanks. Alexx I made these tonight and they tasted lovely but didn’t look anything like your lovely photo. My mixture was very thick and course so when cooked they were very ‘rough’ on the top, not flat and smoothe like yours. Did I go wrong somewhere or did you smoothe yours over before baking? They were still a big hit but just thought I would check as yours have a much more ‘cupcake’ like appearance!